Camilla - Erika Campbell: Day 4 - Ikea........Shopping Bliss or Shopping Stress? Day 4 - Ikea........Shopping Bliss or Shopping Stress? Ikea is not just a homeware shop it's an experience in itself! The people at Ikea know exactly what they are doing and lay the store out in such a way that you have to walk through the whole store looking at room ideas before hitting the canteen for the infamous Swedish meatballs and then carrying on to pick up your flat packed furniture, photo frames and other housewares. My trips to Ikea are never well planned but I'm always excited to go. I love looking around trying to decide what I could put in my house. But the lack of planning means lack of measurements which leads to guess work, frustration and STRESS! Add to that the numerous items I picked up and threw in my basket along the way! By the time I reach the till I'm feeling stressed out, have a load of items in my basket I didn't really want and have spent far too much money! This means I end up leaving behind half the items and going home with stuff I hope will work in my house. Thankfully it usually does!! But then I want to go back and get more but as it is almost a 3 hour drive away I never tend to return for several months. Today's trip was more successful than usual that may be due to the fact I went prepared with a list of frame measurements or because I wasn't with David so had no one to disagree with my ideas! Either way today I left stress free, content and looking forward to getting my new items in my house although quite tired! We even managed to have a laugh or two along the way! 1. Eat before you go, you'll need the energy! 2. Plan before you go and take measurements with you!!!! 4. Stop off for some food half way around, by this time you will either need an energy boost or you will simply have lost the will to live!!!! 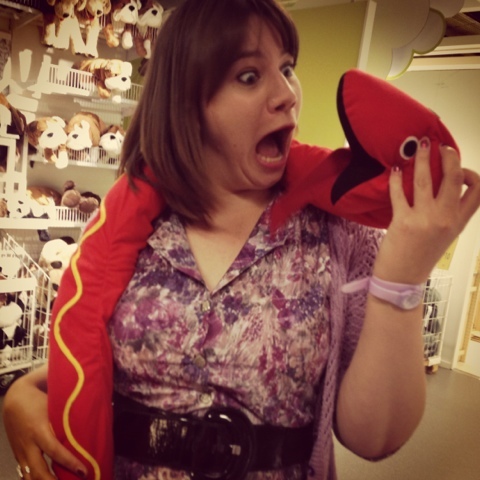 Attack of the Ikea snakes! 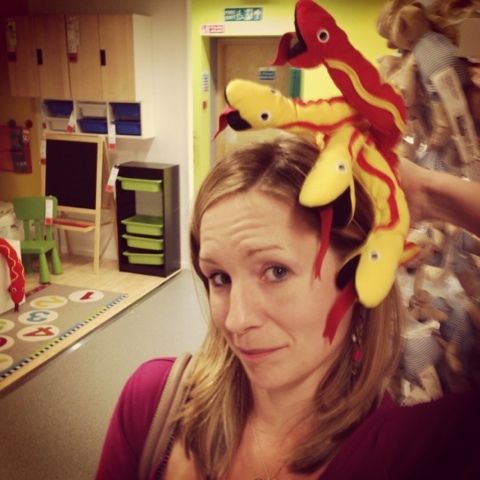 Gill finds an alternative use for some snake soft toys! I love that store but you're so right, it's a trip, it's not shopping. You need snacks and breaks and maybe a hotel room close by so you can take a nap and go back at it the next day. We have one relatively close to me but I avoid it just because it's so visually overwhelming. But I love all the colors! Luckily I didn't go back the next day I just went straight home just as well our I would have got into trouble for spending too much!!! There are so many niece things its hard to easy no!!! Ikea is truly an adventure. :) I have one about an hour from my home, and I've been a few times. It's like a Walmart with a happier atmosphere. There are so many awesome things to buy. I haven't been in a few years because I don't like to go unless I have money set aside for the trip. I'm not a fan of window shopping without some money in my pocket. :) I love your pictures. Thanks keri! Yea IKEA is reasonably priced on most things but you want so much it could end up being pricey! Thankfully just a 3 hour drive away so I don't go often!!! IKEA..every mans nightmare! Unless he is into DIY.. Sure i know WOMEN like DIY too... I don't want to upset you ladies... but why can't they have a daddy creche? Instead of a baby creche.. perhaps have playstations, food, good company maybe if they can change the male thinking on shopping there maybe then more men will go? Also why have they designed most stores with the fact you have to go to the 300th floor in order to come DOWN. Haha like the idea of a daddy creche means us girls would get some peace and then can retrieve the man in time for paying! I think its made worse four men as its really designed so you have to walk around the whole store! Clever thinking on Ikea's part!